Available since November, Apple Music for Android today received an update that brings several new things. The most important novelty is the ability to download songs on SD cards, which means you can store more music offline. As you surely know, this is something that can't be done on iPhones, because no iPhone supports external memory cards (of course, there are also plenty of Android handsets that don't have expandable memory). Another thing that Android users can now do in the Apple Music app is check out the full schedule of Beats 1 radio shows. Moreover, the application now allows you to browse music by composers and compilations. At the moment, users don't seem to be too happy with what Apple Music for Android is offering. The app is rated 3.3 out of 5 stars in Google Play (usually, well received apps have at least 4 stars). Apple Music for Android is free to download, and comes with a 3-month free trial that gives you access to more than 30 million songs. After the trial period ends, you can subscribe for $9.99 per month (individual subscription), or $14.99 per month (family of up to six users). Have you tried Apple Music on Android yet? I just uninstalled Apple Music from my Note 5 yesterday. I'm sure it's better on the iPhone, but it was a bit buggy on my phone. It did get a little better with the more recent updates. does this mean the new iphone will support SD card ? Even if they gave me a icrap phone I wouldn't switch. I don't like iOS it is to boring. Apple will make their own SD cards if at all they change their minds. "Reinventing the SD cards"
They wouldn't even call it an sd card they would make a new name for it, like 3d touch lol. not really like the guy above said on android its buggy on my s6 edge it would stop playing songs or switch to the next song all by itself got REALLY frustrating ,went back to play music so far so good . Even iPhone users don't like it in general. I didn't rate it, but it is a buggy and poorly designed app. It's 5.99$ in my country but with several content missing of course. It keeps stopping & using data even though it's set to play over WiFi only. Even music downloaded to device uses data. Had to stop background data to ensure it stopped. Works fine on my iphone! will i be able to create apple account without giving my payment details? and will those offline downloaded songs can be played from other music players and shared with others? To skip a song, I knew it! 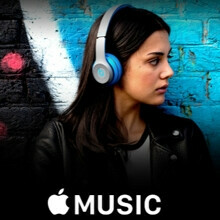 Apple could help with the decline of music sales by making iTunes available on multiple mobile Operating Systems. They should make it cross-platform.